George Ellis Reynolds was born in Pinders Lane, Rugby on 20 July 1894, and baptised at St Andrews Church on 22 September. In 1901 he was the youngest child aged seven living at 61 James Street, Rugby with his parents Thomas and Mary Ann Reynolds (nee Wells) and siblings Thomas (22), Alice (17), Kate (16), Rose (14), Georgina (13), Louisa (9) and Annie (10). His father Thomas was an engine driver (stationery). In 1911 George was 17, an upholsterer, living at 100 Oxford Street with his parents and sisters Kate, Annie and Louisa. The Rugby Advertiser of 18 August 1917 notes that he enlisted in September 1914 and that previously he worked as an upholsterer for Sam Robbins Ltd. He was an Old Murrayan and a keen footballer, playing for both Rugby and Northampton. George joined the 2nd Rifle Brigade as no Z/2327, and had risen to the rank of Sergeant by the time of his death on 31 July 1917 during the third battle of Ypres. He is commemorated on the Menin Gate at Ypres and recorded by the Army and the Commonwealth War Graves Commission simply as George. He is mentioned on his parent’s grave in Clifton Road Cemetery as well as on the Rugby Memorial Gates. He was killed twelve days before his elder brother Thomas Henry Reynolds (qv). He was awarded the British Empire and Victory medals and the 1915 Star – he had been posted to France on 16 March 1915 where his Battalion was heavily involved in the attack on Fromelles in May during the Battle of Aubers Ridge. Edgar Izzard’s birth was registered in the third quarter of 1895 in Rugby. He was baptised on 5 January 1896 at St Mark’s Church, Bilton. In 1901 he was aged 6 and the family was living at 43 Bridget Street. His father William was born in 1852 and was a Stationery Engine Driver. His mother Harriett (née Duckett) was born in 1857. His siblings were Ethel aged 21, Amy aged 16, Horace aged 12 and Dennis aged 1. In 1911, Edgar now a painter aged 16, was still living with the family at 43 Bridget Road Rugby. His father was an “Engineer, Grinding Cement”. His sisters Ethel 31 and brothers Horace 21 and Dennis 11 were also living at home. His sister Amy had married in 1905. Sadly Edgar’s father William died in the third quarter of 1913 aged 61. Edgar joined the 1st Battalion of the Rifle Brigade (Prince Consort’s Own) as Private Z/758. On his Medal card, the date of disembarkation to war in France, was stated as 11 January 1915. During his short service he was awarded the Victory, British and 1915 Star Medals. It is known that the 1st Battalion of the Rifle Brigade was involved in the Battle of Auber’s Ridge on 9 May 1915 and it is likely that he was wounded on that day and subsequently died on 13 May. 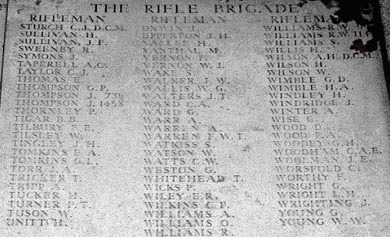 He is remembered on the Ypres Menin Gate, panel 46, 48 and 50 (see below), as were other Rugby men who served with the Rifle Brigade at Auber’s Ridge. The UK Army Register of Soldiers’ Effects found on Ancestry.co.uk shows that in 1919/20 his mother was awarded £3 as a war gratuity. Joseph Henry Upperton was the third child of 11 children, born in 1884 in the St Pancras area of London to Samuel and Sophie Upperton. Samuel was a Draper’s Porter. In the 1901 census the family lived at 60 Pancras Square. Joseph married Grace Elizabeth Anderson in the fourth quarter of 1906 in St Pancras, London. His wife was born in Rugby. In the 1911 census Joseph was 27 years old and living at 10 Holmes Road, Kentish Town, London. He was a porter working for a ladies underclothing manufacturer. He and Grace had a daughter also named Grace. Joseph joined the Rifle Brigade (date unknown) and was killed in action on 9 May 1915 at the Battle of Aubers Ridge, aged 31. His service number was Z/260. His Commonwealth War Grave record states he was in the 2nd Battalion of the Rifles. 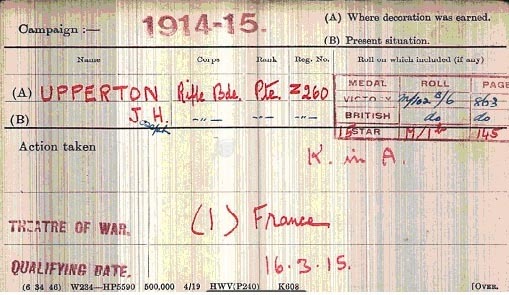 Joseph’s medal card shows award of the Victory, British and Star medals, and that he landed in France on 16 March 1915. Frank Reynolds’ birth was registered in the third quarter of 1893 in Rugby, when his family were living in Campbell Street, Rugby. His father was Tom Reynolds, a well-known local builder who in 1908 then carried out his business from 18 Dunchurch Road, Rugby. His mother was Tom’s first wife, Emma Julia (née Burnham), who died in 1899. His father then married Maria (née Bagnall) in 1900. Sadly Maria also died, in March 1915, just before Frank left for the front in April 1915. In the 1901 the family was still living in Campbell Street, Rugby and comprised father Tom aged 37, his wife Maria aged 27, sons John H G aged 9, Frank aged 7, and Herbert aged 4. 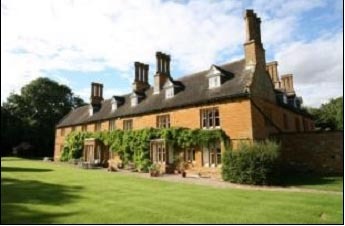 In 1911 Frank was a footman at Michell House, one of the Boarding Houses for Rugby School, at 3 Barby Road and at the outbreak of War, Frank, though still a footman, was now employed by Mrs Cross of Cottesbrooke Grange, Northamptonshire. Frank Reynolds joined the 2nd Northamptonshire Regiment and according to his medal card went to France as Private No.16483 on 22 April 1915. He probably formed part of the reinforcements after the Battle of Neuve Chapelle in March 1915. 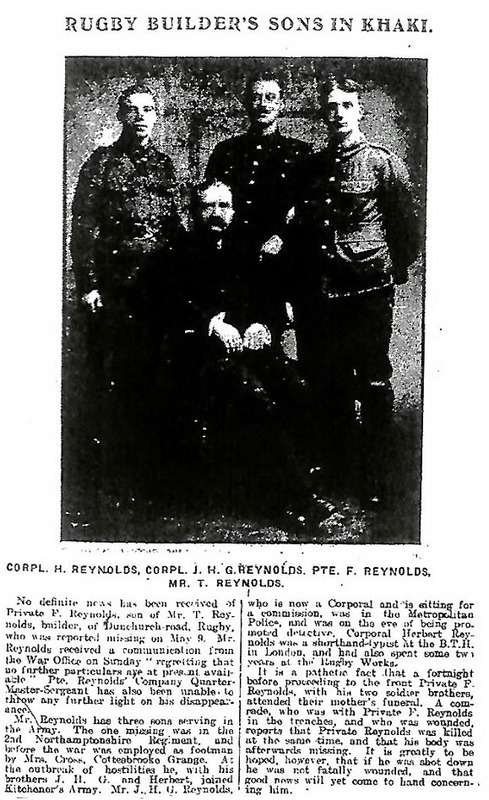 Frank’s two brothers also joined up and an article and photograph (below) of the three boys in uniform with their father appeared in the Rugby Advertiser just after Frank had been reported missing and a colleague stated therein that he was ‘… killed … and that his body was afterwards missing’. A fuller report is available on the action at Aubers Ridge on 9 May, where several other Rugby men in the Rifle Brigade died. There were more than 11,000 British casualties, most within yards of the front-line. It was one of the highest casualty rates of the war. The battle was a disaster for the British, no ground was won and no tactical advantage gained. Frank’s body was not recovered and his death, on 9 May 1915, is remembered by the Commonwealth War Graves Commission on the Ploegsteert Memorial, Belgium. Frank Reynolds was awarded the Victory, British and Star Medals. Frank’s brothers also joined up. John was a Corporal in the 2nd Grenadier Guards and Herbert, also a Corporal, in The Rifle Brigade. All three were killed in action. Frank on 9 May 1915, Herbert on 5 September 1916 and John on 20 November 1916. 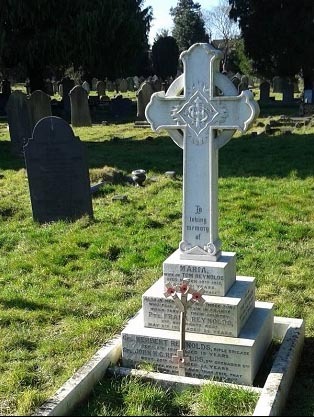 Their father, Tom Reynolds, died in 1936 aged 75 years, his three sons Private Frank Reynolds, Corporal Herbert Reynolds and Corporal John H C Reynolds, and his second wife Maria (née Bagnall) are remembered on a grave in Clifton Road Cemetery, Rugby. On 22 March 1922 Rugby War Memorial Gates were unveiled, dedicated and formally opened. Tom Reynolds, the father of three deceased Rugby soldiers, was asked to open the Rugby Memorial Gates. The Gates were unveiled on Sunday 12th March 1922, which fortunately, in view of the fact that this was a completely outdoor event, was a sunny day. The unveiling was carried out by Field Marshal Earl French of Ypres, assisted by Mr & Mrs Hardman, who had lost three sons in the war. The ceremony attracted thousands of the general public, while the inner area was reserved for subscribers and families of the fallen. The Gates were then dedicated by the Bishop of St Edmundsbury & Ipswich, Dr A A David, a former Headmaster of Rugby School. Mr Tom Reynolds, a local builder who had also lost three sons in the war, formally opened the Gates with a large key presented by Foster & Dicksee, a local firm of building contractors. He was allowed to keep this key as a souvenir. After Mr Reynolds had walked through the gates, those assembled sang “O God our help in ages past”, and the ceremony concluded with the laying of wreaths. War Diary, 2nd Battalion, Northamptonshire Regiment. Northampton Mercury, Friday, 6 August 1915. Rugby Advertiser, 11 November 2011. Arthur William Keen was born in 1896 in Rugby and baptised in St Andrews Church on 17th July. His parents were George Keen and Ellen (nee Powers). George was a Carpenter living at 19 Cross Street. In 1901 the family were at 12 Winfield Street. By the 1911 census Arthur was aged 14 and a Stewards Assistant in a Club. He lived with his family at 23 Cambridge Street. When the war started he was apprenticed to Mr Bodycote as a carpenter. Arthur Keen joined the Rifle Brigade in September 1914 and was reported missing after heavy fighting on 9th May 1915 at the Battle of Aubers Ridge. By 9th May 1915 his parents had been told that he had been wounded and a comrade had written to say that he was missing. 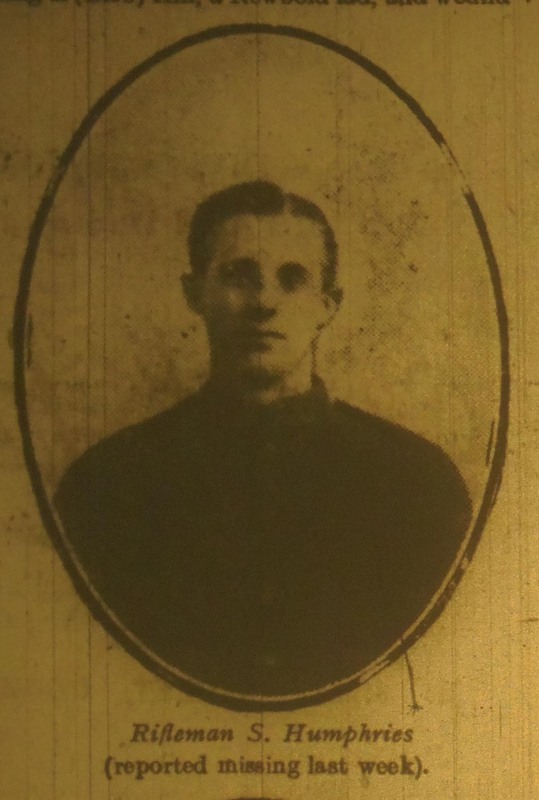 In September the Rugby Advertiser announced that he was still missing, but it was not until April 1916 that Arthur William Keen was officially declared killed in action. He was aged 19. His service number was 450. His Commonwealth War Grave record states he was in the 2nd Battalion of the Rifles. Frederick William Hayes Humphries was baptised at St Andrews Church, Rugby on 15 Sep 1893. His parents Samuel George Humphries and Phoebe Ann (nee Giffin) had married in the same church on 2 Apr 1893, exactly one year after the banns were read. In 1901 the family were living at 6 Gas Street, Rugby, close to Phoebe’s parents at number 8. Samuel’s occupation was “packer in stay factory” and Frederick, age 7 had a younger brother, Jack aged 6. Ten years later they were at the same address and Samuel was a “corset overlooker” and Frederick was a lamp maker at BTH. Frederick was in the 2nd Battalion of the King’s Royal Rifles. The 2nd Battalion was part of the 2nd Brigade, in the 1st Division, and landed in Le Havre on 11 January 1915. He was killed in the Battle of Aubers Ridge on 9th May 1915. At the Battle the regiment was in support of the southern pincer and suffered heavy machine gun fire which cut the men down even as they left their trenches. There were further artillery barrages, but despite repeated efforts no effective gains were made. He is remembered on the Ploegsteert Memorial, Panel 10. He was aged 21. Walter Hardman’s birth was registered in the second quarter of 1895 in Rugby. He was baptised in May 1895 at Bilton. His parents were James Hardman and Elizabeth née Giles and they were married in Rugby in the fourth quarter of 1890. In 1901, Walter was 5 and the family lived in Overslade. And father James was a Domestic Groom. In 1911 James and Elizabeth Hardman had 7 children, Walter being the third child. The family lived in 36 Union Street Rugby. Walter was an Engineers Machinist. 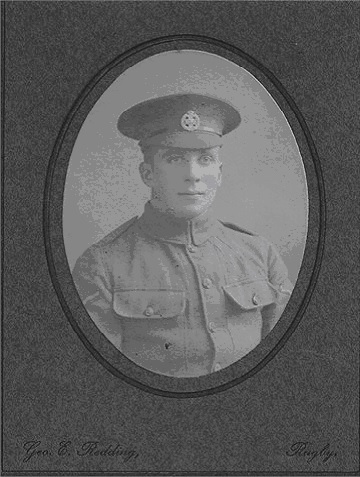 Walter Hardman joined the Rifle Brigade (date unknown). His service number was Z/455. He arrived in France on 26 Jan 1915 and he was killed in action on 9 May 1915 at the Battle of Aubers Ridge, aged 20. His Commonwealth War Grave record states he was in the 1st Battalion of the Rifles but the only military record found, showing award of the Victory medal, states he was in the 2nd Battalion of the Rifles. 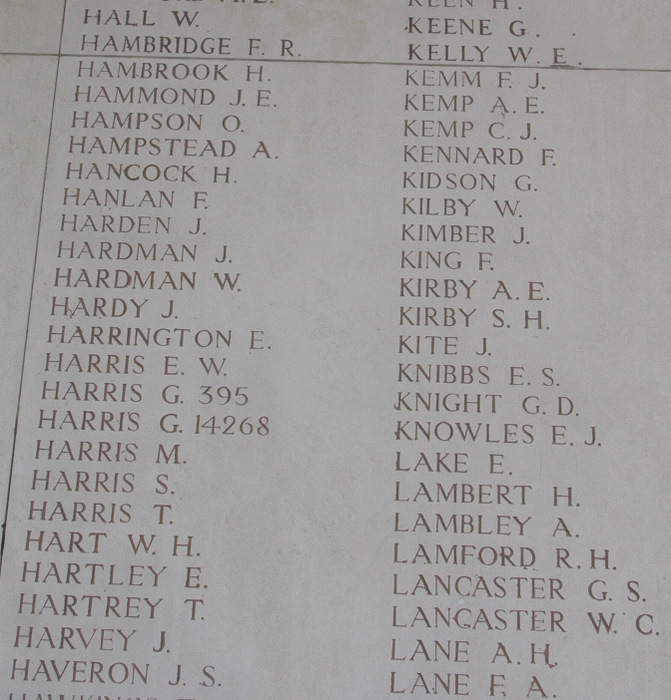 He is remembered on Panel 46-48 and 50 of the Ypres Menin Gate Memorial. Walter was the first of three sons of James and Elizabeth Hardman who died in WW1.